The only thing cooler than a volcano is an ice volcano, obviously. Scientists think they’ve spotted these mounds of icy rock—called cryovolcanoes—on many moons, such as Triton, Europa, Titan, and demoted planet Pluto (sorry, Pluto). Perhaps the strangest one of all is Ahuna Mons, a solitary ice giant half the size of Mount Everest, located on the dwarf planet Ceres. But a new study suggests Ahuna Mons might not have always been the loneliest (ice) volcano in the solar system. The group hypothesized that only one of two scenarios could explain the Ahuna Mons phenomenon: The first is that it the volcano is truly an outlier. Yawn. It’s the second idea that Sori and his team decided to investigate further. Their findings have been accepted for publication in the journal Geophysical Research Letters. So what could have changed—or destroyed—these volcanoes over time? Unlike Earth, Ceres doesn’t have an atmosphere, so natural forces like wind and rain wouldn’t have caused any features on the dwarf planet’s surface to erode. Instead, a process called viscous relaxation is likely the culprit, Sori said. The idea is that, over time, solids, even icy rock, will flow like a liquid. “The prediction that we make is that over hundreds of millions of years, Ahuna Mons will both get shorter in height and broader at its base, so that it’s just flattening out over the surface,” Sori said. Sori and his colleagues created a model to see what viscous flow might look like on the volcano, testing different levels of water in the ice each time. The team found that Ahuna Mons would have to be comprised of at least 40 percent water ice in order to be affected by viscous relaxation. “At this composition, Sori estimates that Ahuna Mons should be flattening out at a rate of 10 to 50 meters (30 to 160 feet) per million years,” according to a press release. It’s worth noting viscous relaxation probably impacts other parts of Ceres’ topography, including erasing the dwarf planet’s craters. 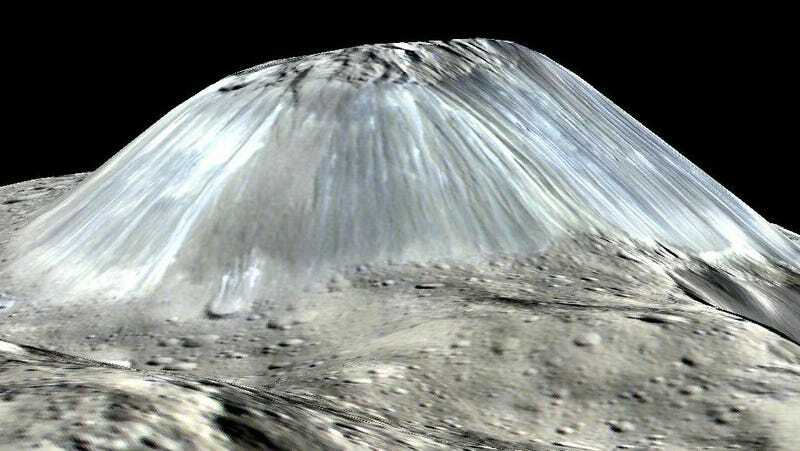 The reason we might only see this cryovolcano and not others on Ceres is because Ahuna Mons is at most 200 million years old, according to Sori. In ice volcano time, that’s pretty young. “Ahuna Mons still has that shape because it’s very young and hasn’t had time to deform,” Sori said, “but the other ones are older and perhaps have had time to do that.” While he’s pretty sure there were other cryovolcanoes on Ceres in the past, the next step is to find out how many and where. The team already has plans to further investigate the entire surface of Ceres, in search of these flattened mountains. Sori said he already has a few candidates in mind.